Join us for an exhilarating morning full of fun, food, and culture at Vora! Enjoy performances of Disney music favorites performed by symphony level musicians and opera singers that will please adults and children alike! Disney's top hits will be performed by soprano and tenor singers as well as a full musical band including piano, violin, drum and bass guitar! Tickets include light Asian fusion cuisine, coffee and kids drinks, and one cocktail per adult. A cash bar will also be available. In addition, those who decide to stay at Vora for lunch will receive a 15% discount on their entire food/drink bill! 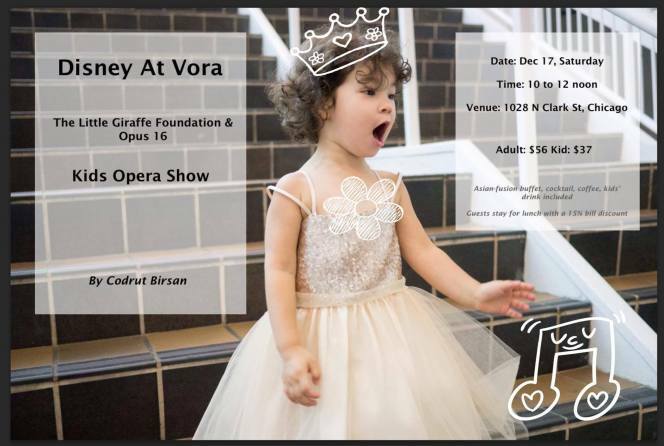 All proceeds from this event benefit Little Giraffe Foundation and will be used to continue funding Neonatal research as well as purchasing gifts for NICU families. This event was inspired by Charlotte Tsou after her pregnancy scare with baby #2 when she found out she needed surgery to prevent premature labor at 20 weeks. In the end, she was blessed with a healthy, full-term baby girl! After this experience she wanted to give back – to families who are not as fortunate and struggling with sick, premature babies in the NICU (Neonatal Intensive Care Unit) fighting for their lives day and night. Please check out her full story on her blog, Lottie + 2! Photo credit to Amie Kuo. Access her portfolio here.